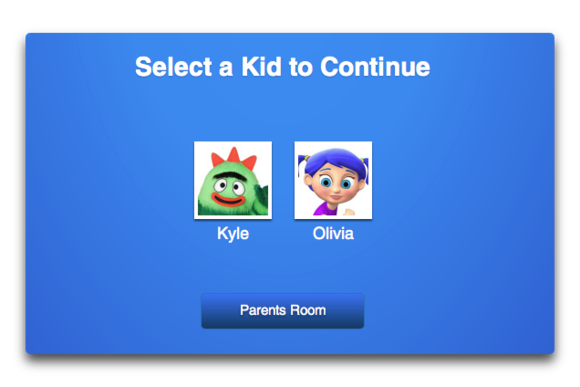 When you sign up for Kidoodle.TV, you not only create an account login and password, but also a four-digit parental passcode. 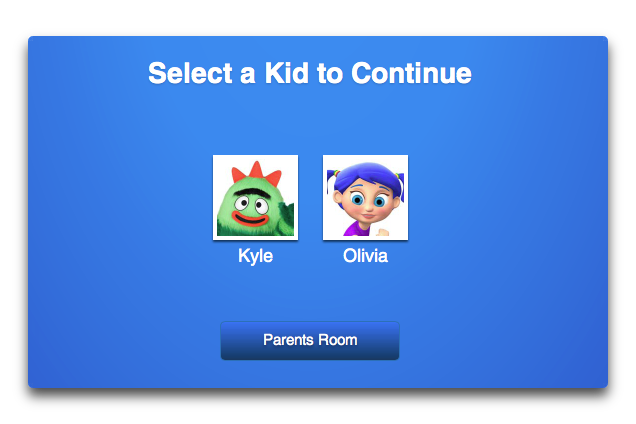 With that passcode, you gain access to the special settings that make Kidoodle.TV a very different service than others out there. Once logged in, you can set up separate profiles for up to five kids, each with its own settings and restrictions. For each you enter a name and pick an avatar from a list of various TV show characters—I went with Brobee from Yo Gabba Gabba and Bo from Bo on the Go—and choose a color theme (blue, orange, or pink). 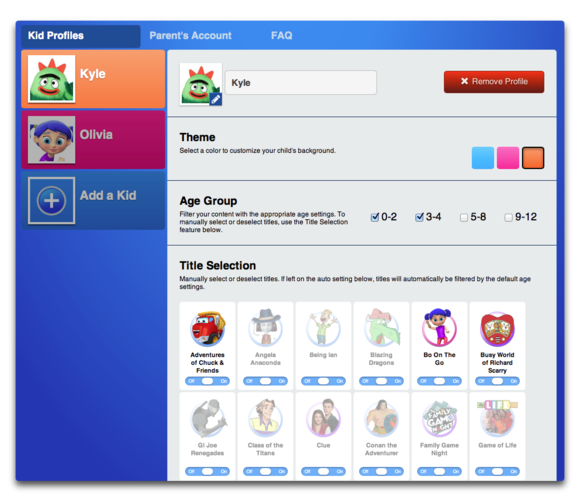 You can create up to five profiles for different kids. Sorry, Duggars. But the really useful options in the Parents Rooms are the ability to filter by age range (any combo of 0-2, 3-4, 5-8, and 9-12) to automatically show or hide groups of shows, and a Title Section area in which you can choose individual shows kids can or can’t watch, even if they fall in or out of the age settings you’ve selected. That kind of granular control makes it ideal for parents who want to monitor viewing more closely. (A feature to limit the amount of time kids can spend watching on Kidoodle.TV is also planned, but wasn’t in the beta version I tested.) At the same time, there’s no way to prevent a younger kid from switching profiles to watch something meant for her older brother, which makes profiles somewhat less useful at the moment. But the company plans to add the option for parents to enable or disable this quick switching feature as an extra layer of customization. Kidoodle.TV lets you get pretty granular with your parenting choices. By comparison, Netflix also lets you create multiple profiles on your account, and lets you restrict access for individual profiles to Netflix’s Just for Kids interface. Unlike Kidoodle.TV, Netflix doesn’t offer restrictions for specific age ranges. 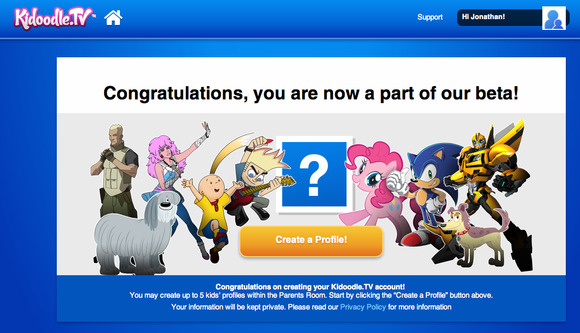 But just like Kidoodle.TV, there’s no way to prevent a kid from simply switching profiles to watch something meant for older kids—or even adults. And on Netflix, the non-kids stuff they’ll find is much worse. One click and they could be on the path to meth and murder. When I tried out the service, there were a total of 49 shows (each with multiple episodes and/or seasons) to choose from. You’ll see an image for each episode, and mousing over gives you the season and episode number, the episode title, and a description. Shows include The Adventures of Chuck & Friends, Bo on the Go, Hurray for Huckle! (which Netflix calls Busytown Mysteries), and Strawberry Shortcake on the younger side, and various GI Joe and Transformers shows for older kids. Netflix offers a ton more kids content than Kidoodle.TV right now, although the company promises additional educational and entertainment content “in the coming weeks.” And part of the beta process will include user feedback to help determine what content gets added (Sesame Street, anyone?). Content choices are pretty small right now, but more is coming. Right now, the other limiting factor to Kidoodle.TV’s utility is the fact that it only works on Flash-enabled Macs and Windows PCs. My kids watch their shows on the TV or the iPad, and never on a computer, so that makes it rather useless right now. But iOS support is promised in the coming weeks (while the beta process is still going on, and before the expected November commercial launch) and Android and game console support should follow at some point. Netflix, with its nearly ubiquitous support across devices and platforms, has a distinct advantage until that time. 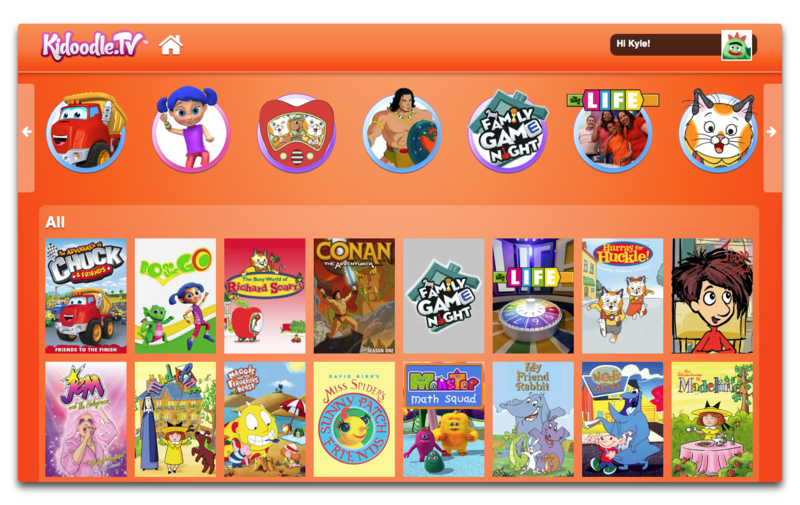 There’s no question that Netflix has far more content and reach than Kidoodle.TV right now. And if you stream kids and non-kids programming, the $3 extra per month to get Netflix is even easier to justify. But as Kidoodle.TV’s shows and device support expand, I can see where it could easily live alongside other streaming subscriptions in the house, due mostly to its focus on parental controls and the more active role parents can take in determining what their impressionable youngins watch.